Another actress is now rumored to be in contention for a new role in Rian Johnson's upcoming Star Wars Episode VIII. The Wrap's Jeff Sneider reported on a recent episode of Meet the Movie Press on YouTube that Diary of a Teenage Girl star Bel Powley is being considered for the role. Other names that have been previously rumored include Tatiana Maslany, Olivia Cooke, Gina Rodriguez, and Gugu Mbatha-Raw. According to Sneider, Powley and Rodriguez are currently the front-runners for the role. You can see Sneider discuss the news below (the Star Wars Episode VIII talk starts around 13:20). 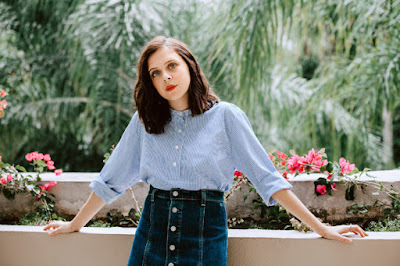 Powley's credits are fairly limited and she hasn't done much outside of Diary of a Teenage Girl. But, as we were reminded with Daisy Ridley in The Force Awakens, being an unknown doesn't mean you can't turn in a stellar performance in a Star Wars film. Speaking of Ridley, the Rey actress is apparently a big fan of Powley. She posted about her admiration of Powley on Instagram last year. Based on this, you an bet Ridley be on board with her joining the cast. Pleeeeeeeease give Gugu Mbatha-Raw a role!